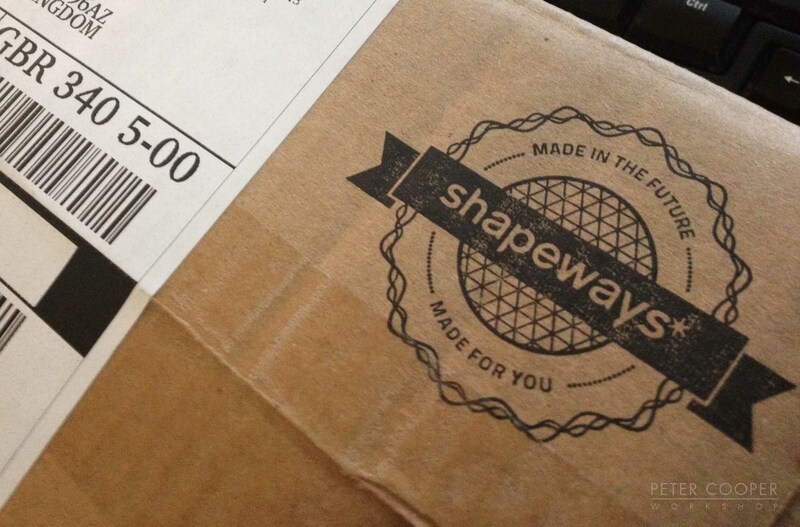 I Received a parcel ! … I wonder what this could be?? I’m totally delighted with the outcome of my very first 3D printed creature. I’ve taken some snapshots of the 3D print ( Please See below). It has maintained more detail than I thought despite being polished. Pointed areas (barely one pixel thick! ), such as the teeth and the tops of the main horns, I’ll need to make sure in future they are slightly wider, the 3D printer needs more to chew on in that area. One of the reasons I chose this creature for a print test was because of his plethora of teeth and skinfold detail, it seemed like a good candidate for a print test. Overall I’m happy. This was a successful bench test and he’s a good size to! The next thing I’ll be experimenting with is hollowing out the inside of the model. This means cheaper costs since essentially you use less material. 3D colour texturing and colour printing is another area I want to explore further. 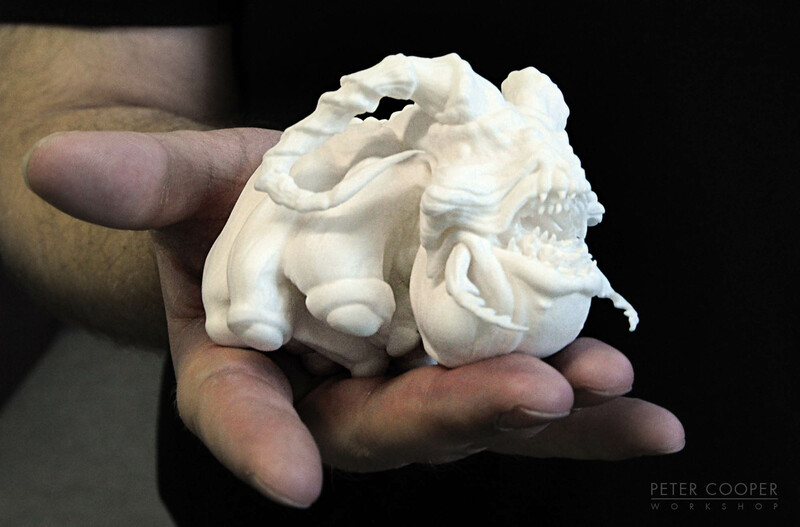 The Creature design is in my Shapeways ‘shop’ currently, but private. I’m so excited and happy with the results so far. It’s very cool being able to handle something physically, that was sculpted inside the computer. I’m now thinking about making a series of creatures for my Shapeways Shop specifically. Exciting times lay ahead! – The model should be less than 1 million Polygons. – Decimation master in Zbrush is perfectly suited to getting polygon count down to where it needs to be regarding preparing for print. 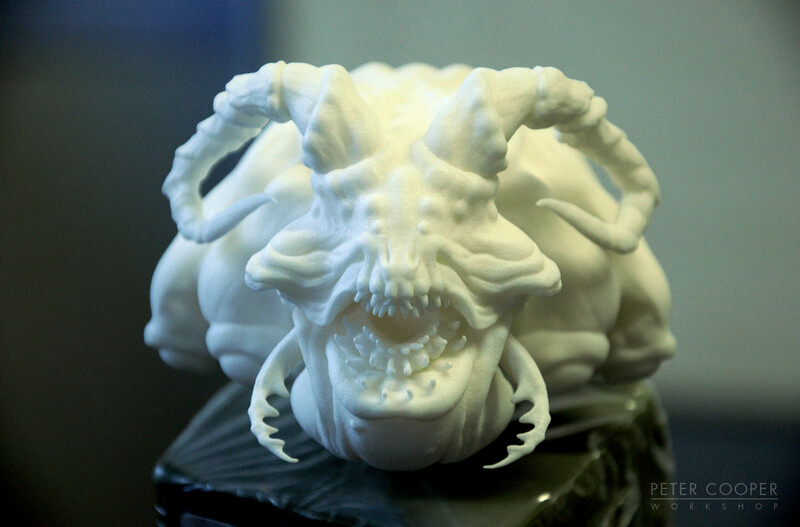 The following images show my creature in it’s full 3D printed glory. I used the ‘Strong and Flexible’ plastic material via Shapeways, but it feels much more like a ceramic material. Sounds like it to when you give it a good tap. I had this fella polished. The detail was maintained well. He needs a display stand. I had a 3D stand built into the original geometry of the creature, but to save on printing costs, the stand had to go. I’ve also been told I should give this guy a paint job. 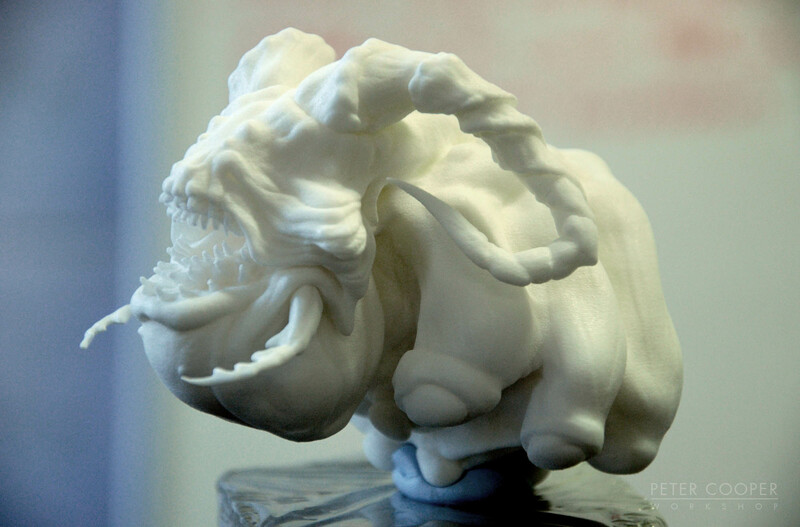 For reference to my earlier creature design that this 3D print is based on, see my post from back in late November. I’ve been told he looks like a Goat Troll, Nice! Following invaluable crit time with the amazing Peter Konig on Zbrushworkshops, this particular character concept has gone through a radical redesign regarding his fundamental forms, expect an update on that very soon.